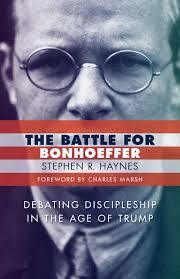 Indeed, The Battle for Bonhoeffer is a book that combines important historical material with current events and issues. Stephen Haynes, professor of religious studies at Rhodes College and a well-respected scholar of Dietrich Bonhoeffer’s life and legacy, is at his best in this - likely to become - well-respected and well-received book. Two of Hayne’s earlier books, The Bonhoeffer Phenomenon: Portraits of a Protestant Saint (2004) and The Bonhoeffer Legacy: Post-Holocaust Perspectives (2006), were also highly respected surveys of Bonhoeffer’s ‘reception and following,’ mostly in the United States. This book, The Battle for Bonhoeffer, extends these surveys by unfolding the multiple ways Bonhoeffer’s theological/political legacy is being used and misused in more recent years, specifically by conservative/Evangelical - but also more liberal-minded - people, leading up to and including the ‘Age of Trump.’ It was specifically the popularization and misuse of Bonhoeffer’s theology by Eric Metaxas in Bonhoeffer: Pastor, Martyr, Prophet, Spy; A Righteous Gentile vs. the Third Reich (2010), combined with Metaxas’s unequivocal endorsement and subsequent support of Donald Trump, that moved Haynes from a more academic reserve and scholarly detachment to an all-out confrontation. Stephen Haynes - in about 2017 - came to believe that customary reserve and respectful critique needed to step aside because too much was at stake; the use and misuse of Bonhoeffer’s theology to buttress the nationalistic and narrow agenda of President Trump required challenge, yes, from a respected Bonhoeffer scholar. In one hundred and forty-eight pages, Haynes takes the reader on a brief historical journey/sketch of (mostly) Evangelical efforts in the past several decades to employ Dietrich Bonhoeffer for Evangelical ends. Haynes is not only professionally qualified, but personally well-suited to lead this tour, since he began his life as an Evangelical. He ends the book with a very poignant and powerful Postscript (Open Letter) to Evangelicals who (still) support Donald Trump. Rightly so, one chapter is dedicated to “Bonhoeffer, Bush, and the ‘War on Terror,’” in which diverse appreciations of Bonhoeffer’s legacy are detailed (Stanley Hauerwas in ‘conversation’ with Jean Bethke Elshtain) as is another chapter focused on “Bonhoeffer, Obama, and the ‘Culture of Death.’” It is at the end of the ‘Obama’ chapter that the name Eric Metaxas enters the journey/sketch, with the publication of his 2010 book, Bonhoeffer: Pastor, Martyr, Prophet, Spy. This New York Times best-seller helped to launch Metaxas’s next project of taking Bonhoeffer on the road, from small town America to the 2012 National Prayer Breakfast in Washington, DC. At those public forums, Metaxas took aim at neuralgic issues like sexuality, abortion, euthanasia, and stem-cell research, employing (misusing?) the words and actions of Dietrich Bonhoeffer. Woven throughout virtually every presentation of Metaxas was his passion to enlist Dietrich Bonhoeffer to confront the ‘liberal erosion’ in America that he shared with many Evangelicals. He was a guest on programs hosted by Glenn Beck and Lauren Green of Fox News; Eric Metaxas clearly understood and aggressively promoted Dietrich Bonhoeffer as an American-styled Evangelical. Again, his contempt for the scholarly guild of academics, who committed their lives to accurately bequeathing the legacy of Dietrich Bonhoeffer to the world, prevented him from knowing that Bonhoeffer was many things, but an American-styled Evangelical was not one of them. It was at about this time that Haynes put his scholarly detachment aside and entered the fray of engagement full speed ahead: “Studying Metaxas’s portrait of Bonhoeffer and his ongoing attempts to use him for partisan political purposes has caused me to rethink my role as an observer of what might be called the American Bonhoeffer. . . while I continue to offer “scholarly” criticism of Eric Metaxas’s interpretation of Bonhoeffer’s relevance for contemporary America, I can no longer do so in the manner of a detached observer. . . Today I no longer believe it is enough to respectfully disagree with someone who relies on Bonhoeffer’s moral gravitas to support President Trump and his policies . . . too much is at stake.” With historical and theological ground laid, Stephen Haynes lays down the gauntlet and offers a Postscript: “Your Bonhoeffer Moment: An Open Letter to Christians Who Love Bonhoeffer but (Still) Support Trump.” In those eleven pages, the author challenges all (Evangelicals) to reconsider their loyalty to Donald Trump, arguing from the standpoint of traditional, Evangelical, biblical values and priorities. It is a passionate appeal. Will it make a difference? Hopefully. John W. Matthews is Senior Pastor of Grace Lutheran Church in Apple Valley, Minnesota, and past-President of the International Bonhoeffer Society – English Language Section. Stephen R. Haynes is professor of religious studies at Rhodes College and theologian-in-residence at Idlewild Presbyterian Church in Memphis, Tennessee. The coauthor of Bonhoeffer for Armchair Theologians, he has also written articles about Bonhoeffer and American culture for the Huffington Post and the Christian Century.